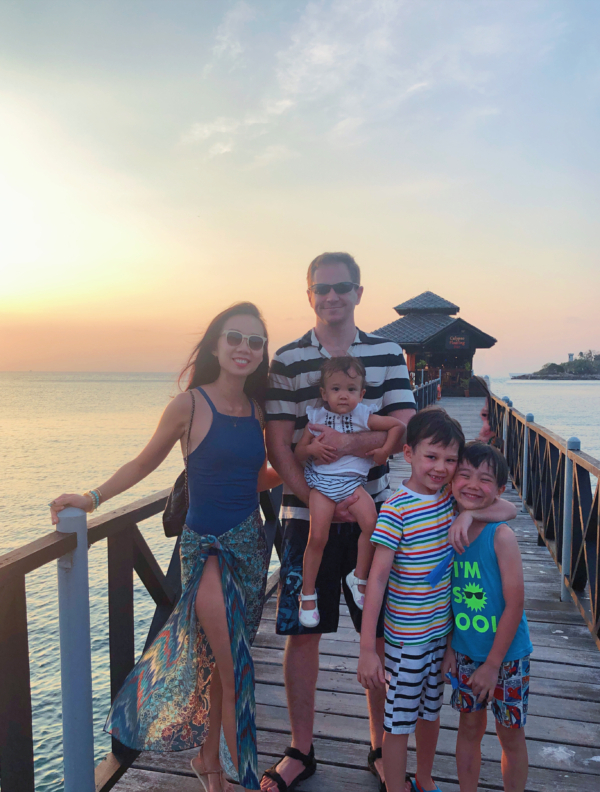 FAMILY HOLIDAY AT BINTAN’S NIRWANA GARDENS RESORT | Beverly's Net: family. food. fashion. 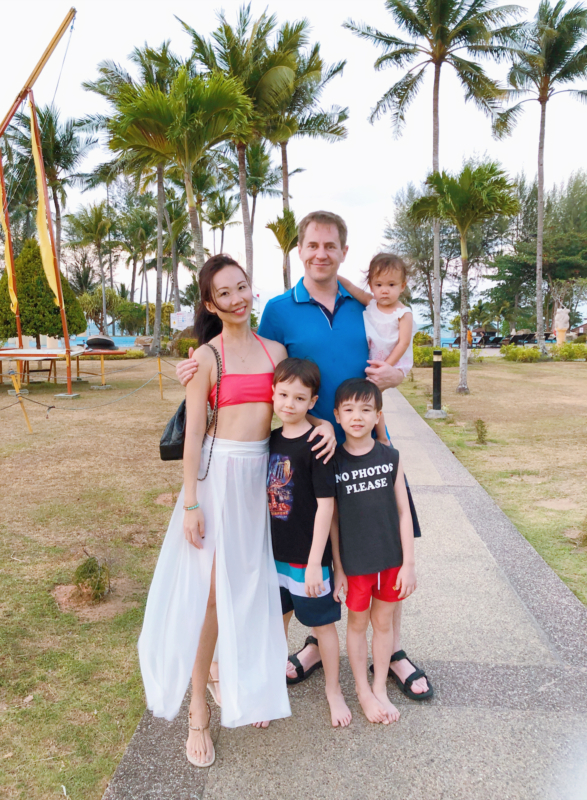 FAMILY HOLIDAY AT BINTAN’S NIRWANA GARDENS RESORT – Beverly's Net: family. food. fashion. Chris recently took on an upgraded role in his company, so he now covers worldwide (vs just Asia Pacific). While it was wonderful news to us and an incredible achievement for him, it almost meant he was now working…. round the clock. He only sleeps between 2-6am every day.. for several months now. This means our entire family has had to adjust. He’s constantly tired, away on many many many business trips, and this means almost all of the home & kid stuff has been relegated to…. me. SO. A nice short break was in order! 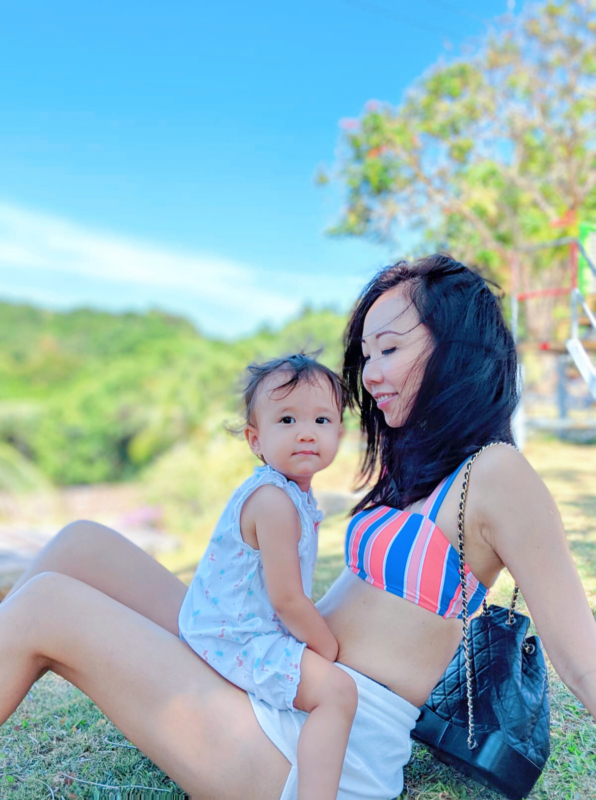 We decided on popping over to Bintan, since it’s really fuss-free to get there. 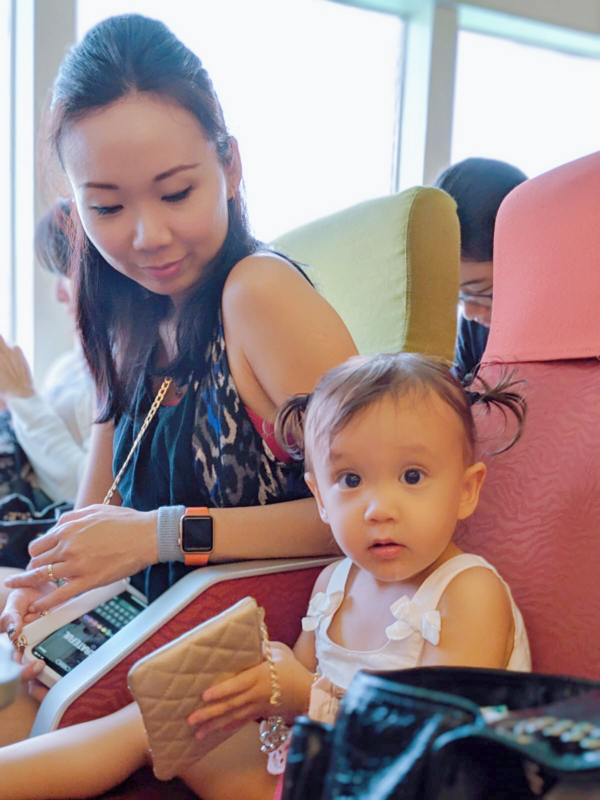 Easy AND fast travel is priority when you’re a family with 3 young kids. 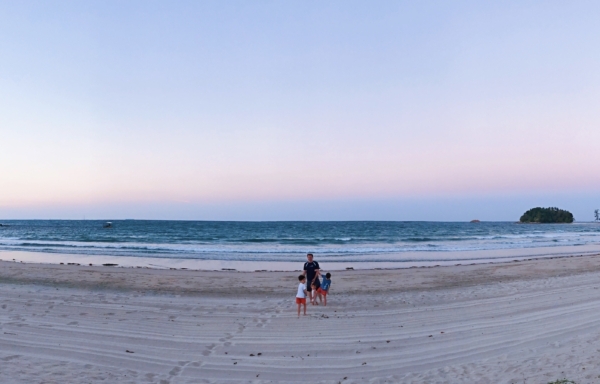 The ferry ride is about an hour from Singapore to Bintan, so that’s pretty much as good as it gets. I dislike immigration and security (because I absolutely loathe queues), but I guess there’s pretty much no choice if we’re leaving the country! Fortunately, Chloe was really peaceful on the ferry there and back, and napped on Chris through most of it. The boys, of course, are fab travellers… so just read books or drew stuff or chatted with each other. 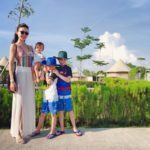 We stayed at Nirwana Gardens Resort! We got the ‘Family Suite‘ since we were there celebrating Chris’ birthday. It was PERFECT for us.. as it had a spacious living room and dining room, a huge bathroom and tub, and a large master bedroom. Our Family Suite was situated closest to the beach, so we could hear the ocean waves at night when we were falling asleep, and in the morning when we woke up. It was sooooo relaxing. 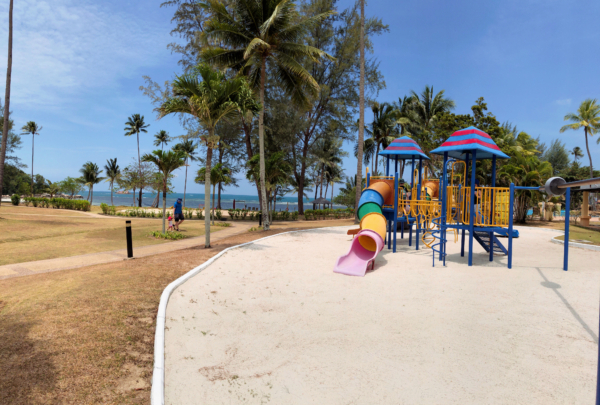 Nirwana is pretty perfect for families.. because it has so many activities for kids to enjoy! Love how this colourful playground is situated right outside our Family Suite too, so the kids could have a climb in there every time we walked past. Their pool is huge. And I mean.. HUGE. It’s almost like a maze, swimming around it, and the kids loved loved loved the pool so much that – errrrrrr – they never made it into the ocean! My boys don’t like the ocean (the waves freak them out, and Hunter can’t really handle the “mess”) and Chloe flips out with sand on her feet.. so they simply refused to go. Especially when the pool was so epic anyway! OK there’s one downside to their epic pool… and it’s the fact that it has no shade from the sun. Pretty much ZERO shade the entire day! Even the cabanas and deck chairs were out in the sun.. with maybe only 5 of them under a tree. We were lucky to get the cabanas in the shade though, so the kids could chill and Chloe could nap in there. This also meant all of us definitely tanned.. despite putting on loads of sunblock! OK I liked. This was the only spot of shade in the entire huge swimming pool. 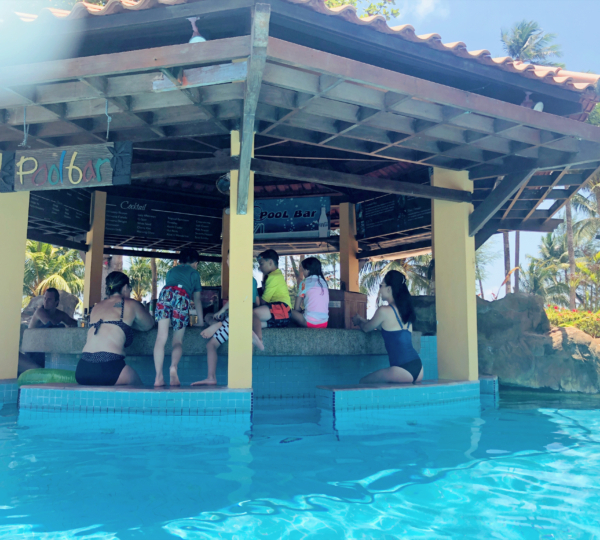 The Pool Bar. Hilarious! So, of course, we had no choice but to hang in there and drink cocktails… (and cocktails for the kids). This is where Chloe snoozed every noon. It was cool in the cabana’s shade, there was background noise with the kids swimming in the pool, and the breeze was wonderful. She loved it. Nirwana Gardens is actually part of a group of resorts in the area, so you can catch a shuttle between each one, or walk. 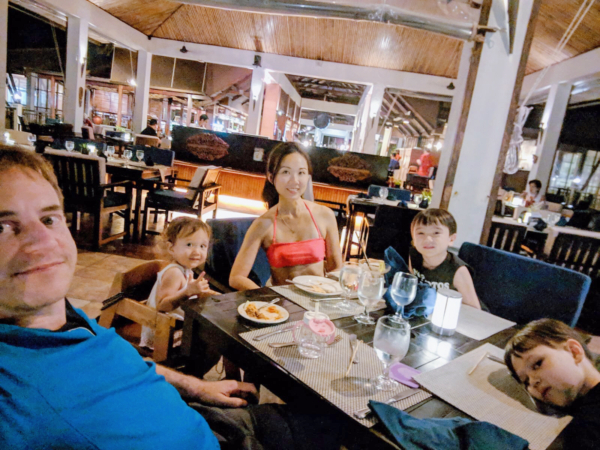 We took a short walk along the beach, and ended up at another resort! Gorgeous beach with fine white sand. The boys loved running around there, and surprisingly, so did Chloe! So remember what I said about Nirwana Gardens being great for families? THIS is why. Their Kids Club is craaaaazy! It IS a bit weird, because the building is a stand-alone one about 2 mins walk from the resort, and the building looks really deserted from the outside. The Kids Club is on the 2nd floor (above their massive bowling alley) and is HUGE. It has a full on playground with swing and slide for the lil kids, which Chloe loved, as well as lots of different spaces with various activities and toys. Frankly, the kids all just liked running around and doing random things in there… they loved the space! And they have a Nintendo Wii. Which I found kind of annoying (because I don’t like my kids on screens AT ALL), but thankfully it’s only turned on at specific times. Hunter nearly fainted with happiness when he discovered their Wii – which was obviously his favourite activity at Kids Club. He would play bloody Mario Kart on that bloody thing allllll day long if he could. 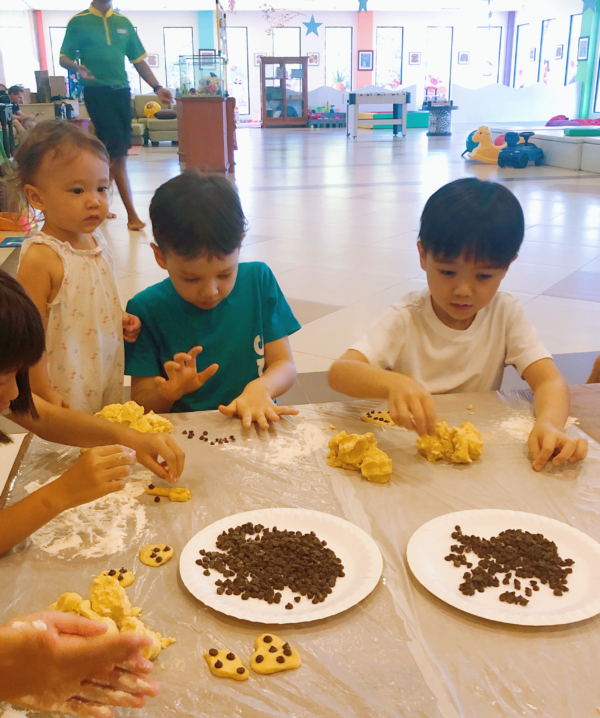 The Kids Club has a variety of activities through the day, and there’s a timetable so you can drop in whenever you want to partake in them. 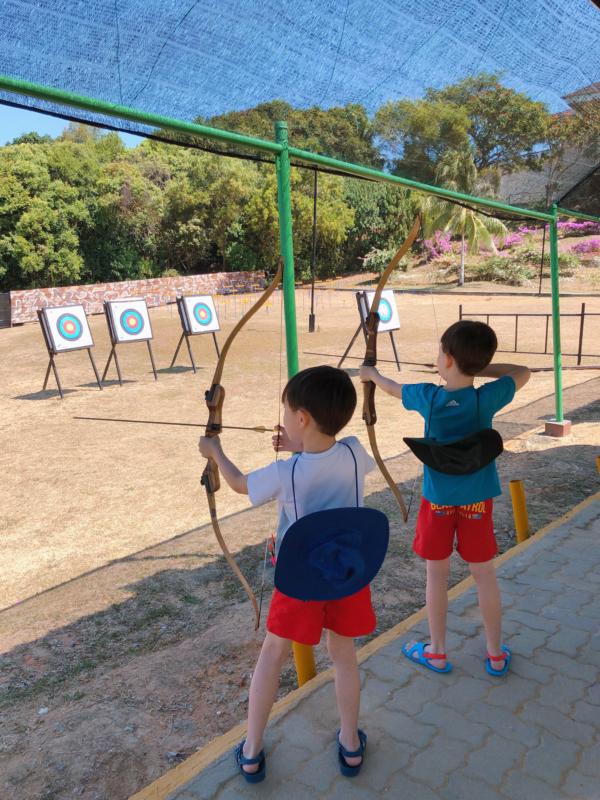 Carter’s favourite was Archery – no surprise there, since it was sporty! He was actually pretty good at it for a little kid, and nailed the target several times! 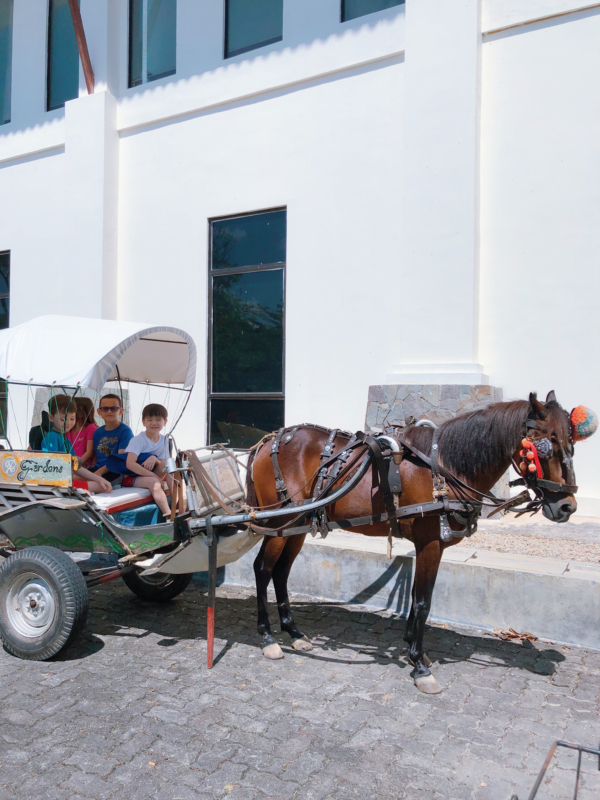 They also have this cute horse carriage that can carry up to 4 kids. It’s about a 10 minute ride around the resort.. and quite a treat since it’s among all the greenery and hills. Chloe’s favourite activity was…. cookie making. Or rather, eagerly monitoring her brothers making the cookies, then devouring them afterwards. She’s now learned the word “cookie”, and now that we’re back home, will excitedly holler out “COOKIE!!! !” when she spots one. MY favourite activity was…. 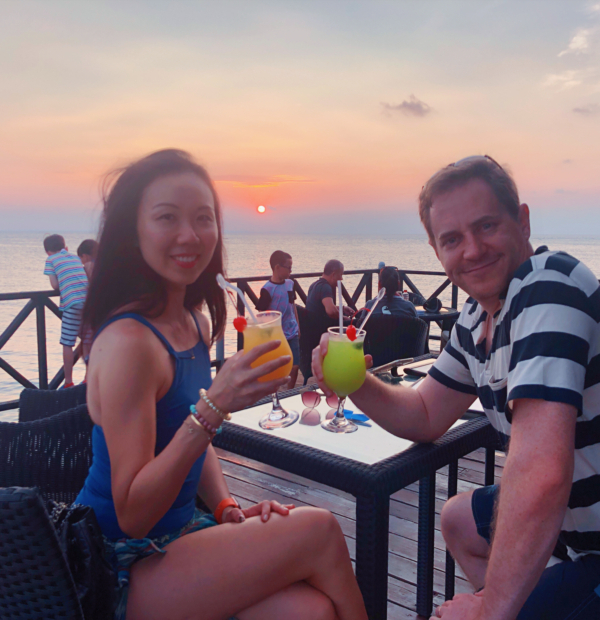 sunset drinks. We had 5 kids (!) tearing around the place, but hey, it was still fun. The view was GORGEOUS, and it was so breezy since we were right over the water. I absolutely loved it! There are a couple of restaurants in the resort group – all accessible by walking or shuttle. The food was good, with great options for kids, but it was all Singapore ‘nice dining’ prices. I wasn’t surprised, since Bintan in general has a really bad reputation for overpriced food (it’s probably 1/10 the price outside of Bintan). 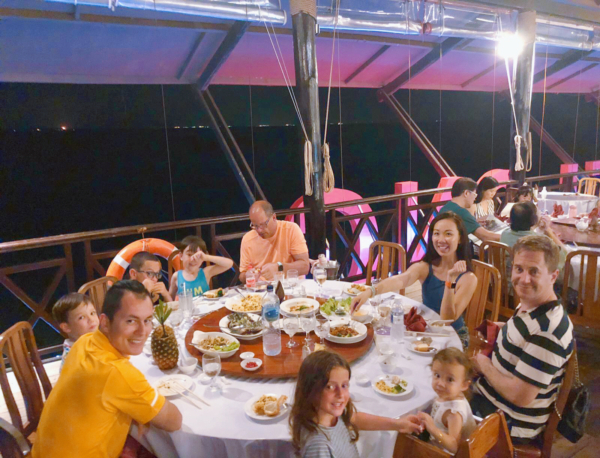 The Kelong Seafood Restaurant is also part of the resort group, so we took a shuttle there for dinner. It’s extremely touristy, of course, but… we’re suckers for stuff like this. Food was pricey but it was really fun having a big banquet with friends. And all the kids ate SO well, so it was worth it! Here we are.. all tanned and flushed from the afternoon swim, just enjoying the ocean breeze and being HAPPY. We really needed this little break, and it was just perfect. Chris took this photo of Chloe and I, as we sat on a grassy hill, watching the boys in the horse carriage go by. She’s stuffing her hands into my belly fat (that hurt! ), but otherwise, I love the moment that this photo captures.